We stock a full inventory of replacement mirrors for virtually anything on the road. If your mirror is broken, we can get you seeing clearly and safely in virtually no time; for a fraction of the cost of a dealer replacement. Reach out to us today by using our free quote form or calling us at your convenience! A broken side view mirror can cost hundreds of dollars to replace at a dealership - they replace the whole mirror assembly. We can preserve features such as electric heat in many cases. 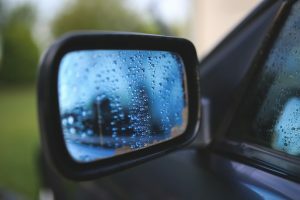 Side view mirrors are made of a special partially transparent mirror to reduce night glare and passenger side mirrors are convex to enlarge viewing area. We carry rear view mirror replacements that will mount to the factory metal tab of most windshields and cost less than a dealership part. We can also bond a mirror to a windshield that is missing the metal mirror tab. If your existing rear view mirror comes loose from your windshield, we can re-attach that too.